Note: The DCC1001 is being replaced by a new Phidget which will be available in May 2019. The new device will have the same function and form factor, but will have a maximum motor current of 4 amps. The DCC1001 gives you complete control of one medium sized DC motor from one of the ports on your VINT hub. You can control motor velocity, acceleration and braking strength using commands from your software. 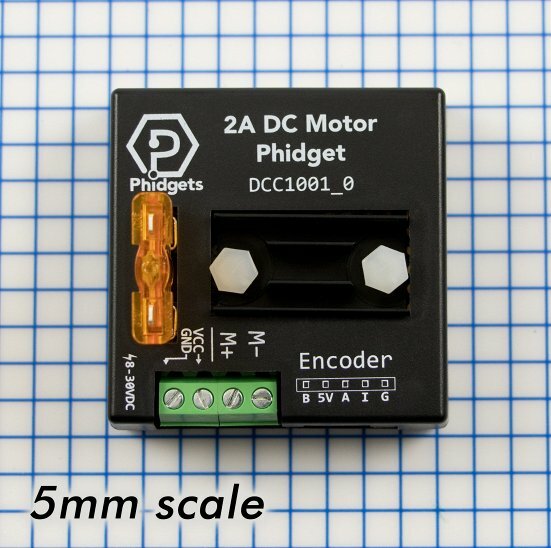 The compact and enclosed form factor of the DCC1001 makes it easy for this Phidget to fit in smaller projects while still controlling motors with current ratings of up to 2 amps. 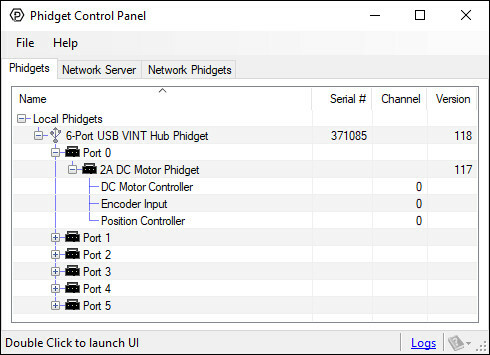 See the Connection & Compatibility tab for a list of devices with VINT ports that can connect to this Phidget. This controller comes equipped with an encoder input that can read in the quadrature signal from an encoder attached to the shaft of your motor. 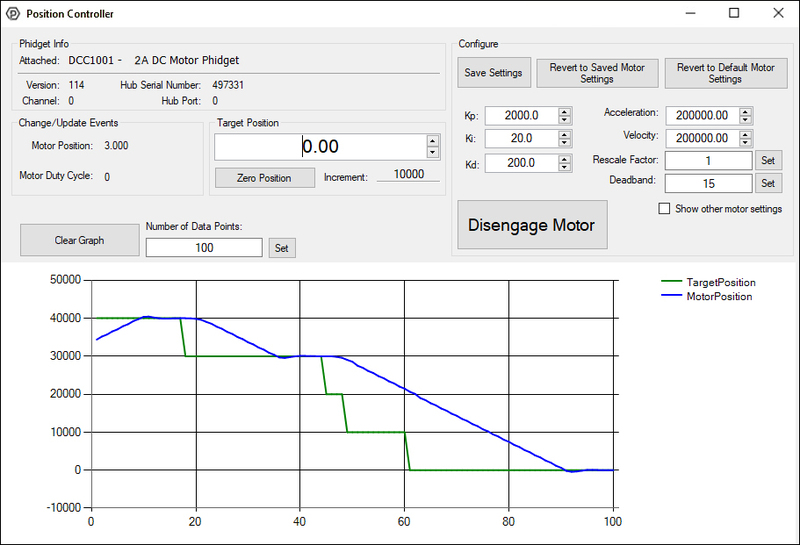 Using the MotorPositionController object in our API, you can use the encoder to implement a PID control loop. 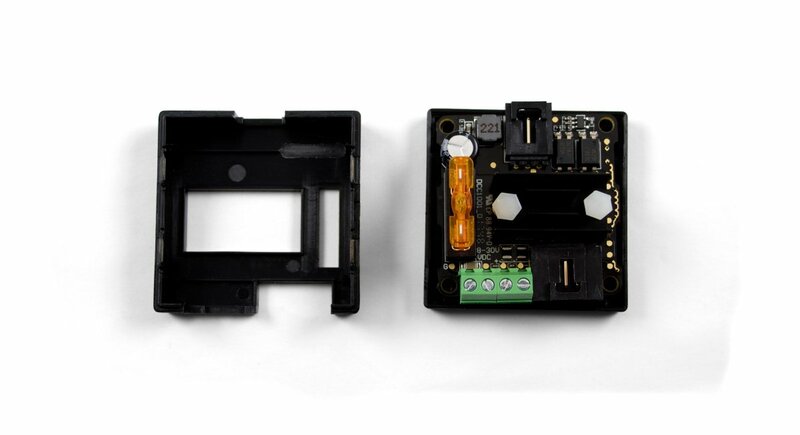 A built in heatsink on this controller prevents it from overheating during operation. The VINT port on this device is isolated from the rest of the board, greatly improving reliability and eliminating ground loops. Your VINT Hub and computer will also be safe in the event of a current spike coming back from the motor. The power terminals on this device are polarity protected: if you happen to hook up the power supply backwards, the device simply won't power up and won't be damaged. There is also a 5A fuse included on-board to protect the controller in an over-current event. These DC motors all have encoders attached to the rear shaft, allowing for closed-loop position control of your motor. These encoders will connect to the encoder input on the DCC1001 via the cable included with each motor. Linear actuators are simply DC motors that are hooked up to a linear screw which causes the shaft to move laterally instead of rotating. Unlike a rotary DC motor, linear actuators have a minimum and maximum position at which the shaft cannot contract or extend any further. On its own, the motor would not be smart enough to stop before attempting to push beyond these limits, possibly damaging the motor. 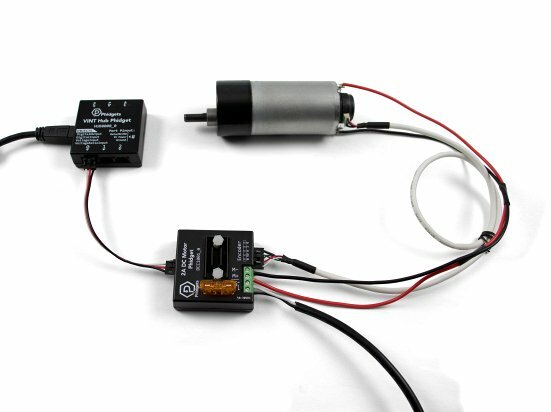 That's why each linear actuator also has a built-in feedback potentiometer so you can monitor the position of the shaft and prevent the actuator from stalling out at its limits. The potentiometer can be read by the analog input on the DCC1000. This Phidget requires a power supply between 8 and 30V DC. We recommend that you use a 12V DC power supply for smaller motors and a 24V supply for larger motors. Check your motor's specifications if you're not sure. For best performance, you should get a 5 amp supply. Select the power supply from the list below that matches your region's wall socket type. 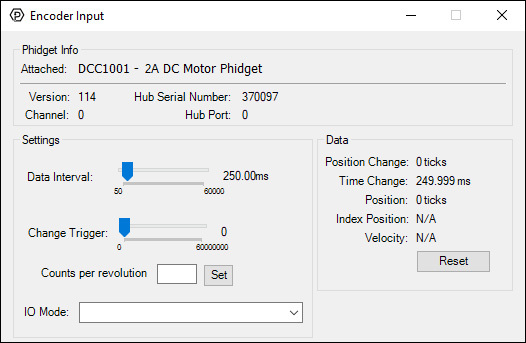 Connect the DCC1001 to the VINT Hub using the Phidget cable. (Optional) If your motor has an encoder, connect it to the encoder port on the DCC1001. Connect the power supply to the DCC1001's power terminals. Now that you have everything together, let's start using the DCC1001! 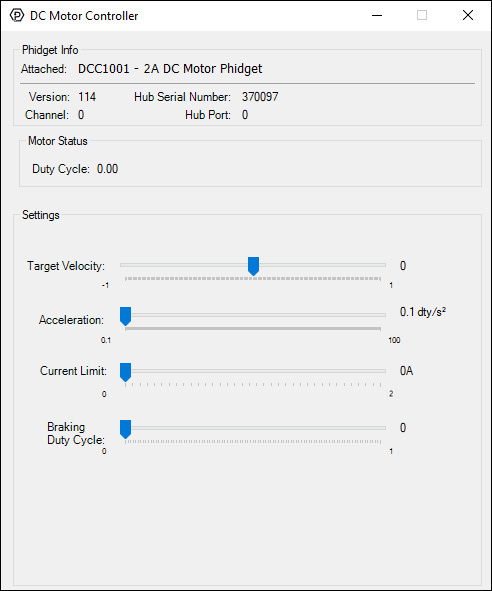 In order to demonstrate the functionality of the DCC1001, the Phidget Control Panel running on a Windows machine will be used. Linux users can follow the getting started with Linux guide and continue reading here for more information about the DCC1001. DC Motor Controller: Controls the velocity and current of the motor. You can set the control parameters Kp, Ki and Kd in order to change the behavior of the control loop. You can save these variables into the program so you don't have to re-enter them manually (NOTE: This does not store the settings on the DCC1001, it simply saves them inside the control panel program, so you'll have to re-enter them if it's used on another computer). 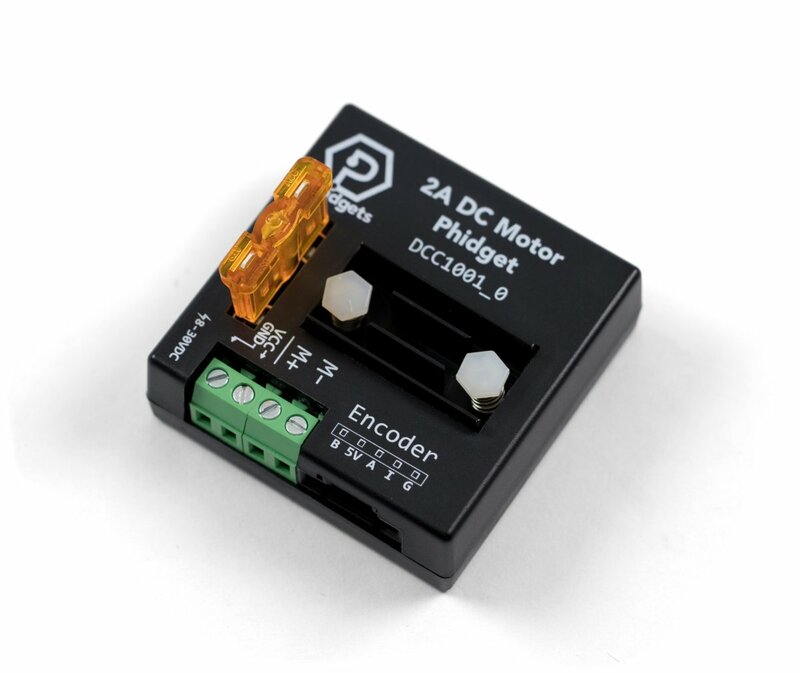 This Phidget is compatible with the DCMotor Examples, the Encoder Examples and the MotorPositioncontroller Examples.